Felicitous | Leah Palmer Preiss ~ Curious Art: Acrylic on collaged text on canvas, 6"x6"
Felicitous Acrylic on collaged text on canvas, 6"x6"
Another in the probably-not-so-mysterious series that began with Malinger. 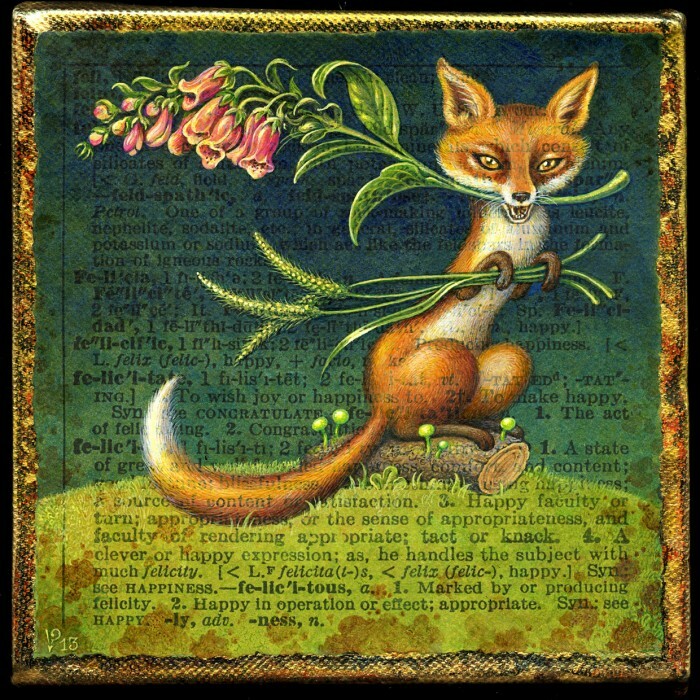 It is felicitous indeed that Illustration Friday’s word this week is “tail”– this fellow not only sports his own fine fox tail, but also holds a bunch of foxtail grass. Also featured (though tail-less) are foxgloves, some glowing foxfire mushrooms, & some faux-foxing around the edges of the paper. This entry was posted in A Word A Day Illustrations, Prints Available and tagged Acrylic, AWAD 2013, Felicitous, Fox, Foxfire, Foxglove, Foxtail, Illustration Friday, Tail on 20November 2013 by Leah. Thank you so much, Iain! Love your collage effects…..do you photoshop the layers in….or are they all painted?? Sometimes though, I add so many layers of paint that the text disappears, so I do occasionally repaint the letters!